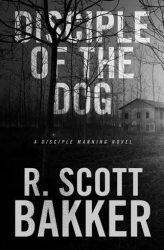 Disciple of the Dog is about a private investigator, Disciple Manning, who is hired to look into the disappearance of a beautiful, young middle class woman by her parents. Jennifer joined a cult that believes the world is an illusion, that it is really five billion years older than it appears and that therefore the Earth is shortly to be consumed by the dying Sun. Then, one night, she disappeared. Disciple is the first person narrator of the story – and is both blessed and cursed with eidetic memory – true total recall. He comes across as a charmingly obnoxious cynic. In his initial interview with Jennifer’s parents, he explains to the reader that, when his clients start to get upset, to cry, the best thing to do is discuss his price. He is also intensely world-weary – he remembers in perfect detail all the worst moments of his life; his phenomenal memory continually sabotages his relationships with women: he simply gets bored with them. So, when he gets the chance to hook up with a young woman journalist hoping to get a story out of Jennifer’s disappearance, he leaps at the chance to get her into bed. And, while the premise of the case seems straightforward at first, he quickly becomes excited by the anomalies he finds. The cult leader is a jovial and charismatic ex-psychology professor who takes all of Disciple’s barbed comments with ebullient good humour. The police chief is a gentle, youngish man who seems out of his depth. The small town where the cult is based is dominated by the sinister Church of the Third Resurrection. And then Jennifer’s fingers and toes start turning up around the town. As long as you engage with the charming part of Disciple’s persona and not the obnoxious part (and I did), then Disciple of the Dog is a very entertaining detective story. Although Disciple is pretty full of himself, he’s also engaging and a little tragic. His singular talent enables hims to dispense with taking notes and to go over people’s words, tone and body language at leisure – theoretically making him a formidable detective. On the downside, apart from his personal demons, he has few flaws as a fictional character – his military and prison experience make him hard as nails and seemingly make him impervious to physical danger. And in the end, he has little to do with the resolution of the case – the answer comes at him out of leftfield, and he simultaneously watches events climax on TV in his motel room. 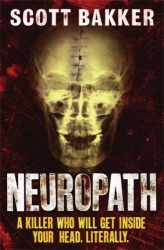 This is a better book than R Scott Bakker’s previous thriller, Neuropath, which I liked a lot. Where that other book was full of rather self-indulgent infodumps about the nature of the brain and consciousness, this one is much more concise. The story moves along at a brisk pace and never gets boring. It’s also quite short – due to its abrupt ending – but I think the length works well. I highly recommend it.